We define safety as the capability of an organisation to avoid occupational accidents and work-related diseases and to minimise their consequences as well as to maintain and develop the health and well-being of their employees. One crucial safety activity is to learn from past incidents. With incidents we mean both accidents, diseases, near-misses, and all events that precede these. Individuals can learn from those incidents that they detect. Effective organisational learning is possible when these incidents are reported and investigated. Incident investigation reveals hidden human, technical and organisational weaknesses that can then be improved. We believe that near-miss reporting rate is one of the best indicators of an organisation’s OHS culture. Near-miss reporting programmes have shown dramatic results. As a typical example, accident rate decreased to one-tenth and reported near-misses increased four times in six years following the implementation of an incentive reporting programme for near-misses. The programme improves the safety capability and culture in many ways: by revealing hazards and organisational weaknesses that can be eliminated, and by developing the awareness of people. 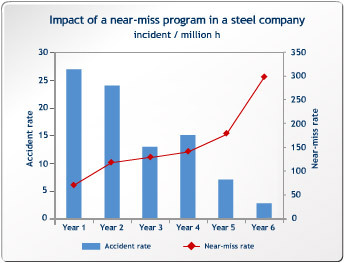 The on-going increase of near-miss reports shows that people are able to identify and are also willing to report preceding events and circumstances early on. Peoples' own subjective risk assessment has developed, which in turn has a positive effect on their safety behaviour. Why report a near-miss? – 3T Online awareness-raising module.